Come watch The Game with Harvard and Yale alums and fans! 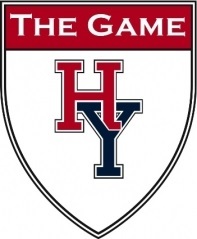 It's sure to be a lively crowd this year as we cheer on the teams playing the 133rd game of the historic Harvard/Yale rivalry in HD, so be sure to come show your support! Plenty of food will be served, and is included in the price of the event. Each attendee will pay for their own beverages. $25 covers cost of food and non-alcoholic drinks. Will the Crimson continue its winning streak or will this be Yale's lucky year? Hope to see you there to find out!